Thirty-three degrees Fahrenheit feels almost like t-shirt weather to us in southern Minnesota today. It’s all relative, of course, but after last week’s deep freeze our bodies have become so accustomed to the outdoor cold that temperatures above freezing, even if only by a few degrees, really do feel “warm.” That’s why we actually do see people in t-shirts (and sometimes shorts) as early as late March some years in forty-degree weather, whereas the same temperatures in the fall cause us to put on jackets and coats. Don’t get too accustomed to this warm-up, though, as the high temperature on Sunday is forecast to reach only the mid-teens, followed by temperatures in the single digits (and even below zero again) for several days as we enter the first week of February. At this point only next Monday shows a little chance of a snowstorm; other than that this relative “dry spell” looks to continue. Both Wednesday morning and this morning brought light hoar frosts upon the landscape, caking our trees in a fine crystalline layer of ice for a few hours before melting (to read more about how hoar frosts occur, see the “Arb Sightings” post for Jan. 14, 2010: http://arboretum.blog.gustavus.edu/2010/01/14/arb-sightings-11410/). While not as impressive as those seen a year ago, their occurrence is nonetheless a part of the yearly pattern of observable nature that we call phenology. And that in itself is the reason why I write this weekly blog, so that readers can learn a sense of what is expected throughout the seasons, year after year after year, if they care to look. Naturally the events will vary a bit in terms of the day or week in which they actually occur, but they will occur nonetheless. For me, this sense of cyclical progression keeps me going, because no matter the time of year I will always have something to look forward to; in this sense, the January hoar frosts are just as important as the first returning flock of Canada Geese in mid-March or the first blooms of New England Aster in early September. 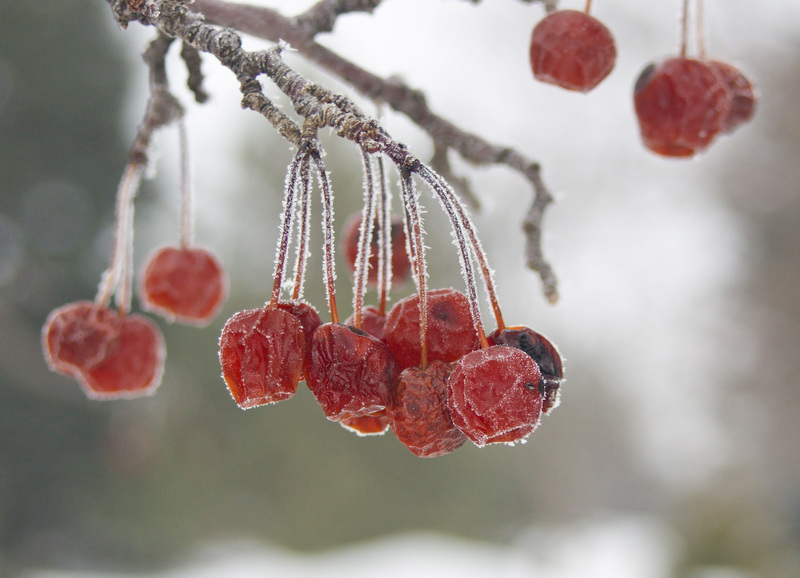 Light hoar frost covering crabapples in front of Interpretive Center, 1/28/11.